Looking for Claremont Window Cleaners you can trust? Call 1300 72 87 72 Now! We clean windows in Claremont! Every Claremont homeowner dreams of a beautiful, stunning house that looks and feels great. However, according to experienced homeowners, the idea of maintaining a clean house is easy said than done! It is a tacky process that should be handled with lots of care and concern. If you are in Claremont, house maintenance is no doubt of the utmost importance. Bounded by three busy bay roads, Claremont is a residential haven. It is filled with scintillating real estate properties with more than 4000 dwellings. Three major components in all Claremont home improvement routines would be window cleaning, pressure cleaning and gutter cleaning. Luckily, there are plenty of service providers to help you with these three chores. Always remember that these maintenance routines will make your house appealing, increase the net worth of your home and minimise the cost of repairs. If you are unsure of DIY windows cleaning, fear not! 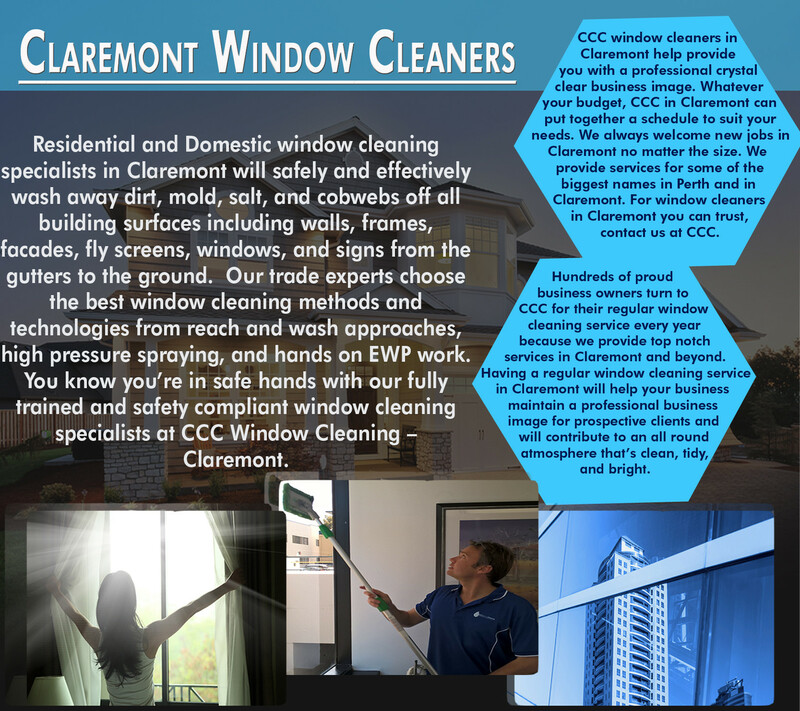 Professional window cleaners in Claremont are here to lend you a hand of help. How unpleasant and annoying a dirty window can be? As mentioned previously, window cleaning will enhance your home’s overall view and appearance drastically. The idea of looking through dirty windows is like using dirty sunglasses. What a pain in the glass. To maintain a crystal clear view from your home (at all times), window cleaning should be a part of your standard maintenance routine. The exterior and interior surface should be cleaned at least once in every two to four months in Claremont. Be Glassy and get your window cleaned regularly! Do you know that dirt, dust and grime can reduce the overall lifespan of your windows? Stubborn dirt particles can introduce cracks and crevices in the window sills. When you don’t clean windowsills periodically, you will expose it to more dust & dirt. Bio matter, sap and salts can cause the windowsills to wear-out with time. To be much more specific, dirty window screens will have an impact on the condition of your windows. A lot of people confuse this stain with rainfall and street dust. In general, the real stain is not caused by rain or road pollutants. It is an after-effect of dirty window screens. This is why professional cleaners in Claremont invest on techniques that ensure both windows and its screens are washed! Apart from being a time consuming chore, window cleaning can be a dangerous process too (especially if you have a two storey home)! This is why it’s always a good idea to opt for professional cleaning companies that are insured, bonded and licensed.